This Running Balance Spreadsheet Calculator aims to help you calculate a running balance for deposit/withdrawal of your bank account, rent received/balance owed, etc. 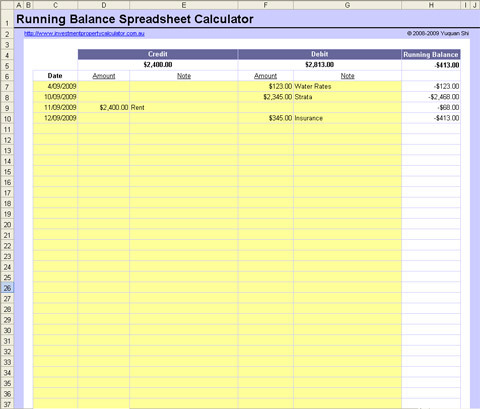 Here is a screen shot that will give you a better idea that what you need to do and how this free Running Balance Spreadsheet Calculator can help you. Please note: This calculator currently accommodates 8,000 rows of data. If you need more, please contact me. Download FREE Running Balance Spreadsheet Now!